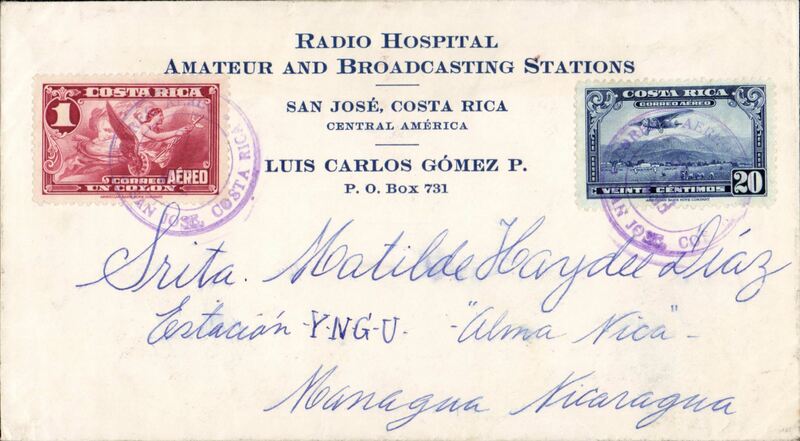 Acceptance of mail for the United States for carrage on the first airmail service in Coata Rica, plain cover addressed to Barcalays Bank, New York, postmarked 'San Jose Ene 10 1924' cds, violet 'Transito' hs and 'Turrucares/ Ene 11 1924' cds tying 5c light blue, and special violet circular "Correo Aereo/Ene 11 1924/San Jose-Limon" cancels front and verso. Carried on the third of only five flights of the temporary service operated by US Army aeroplanes during suspension of railway communication between San Jose and Puerto Limon from January 5th-15th. 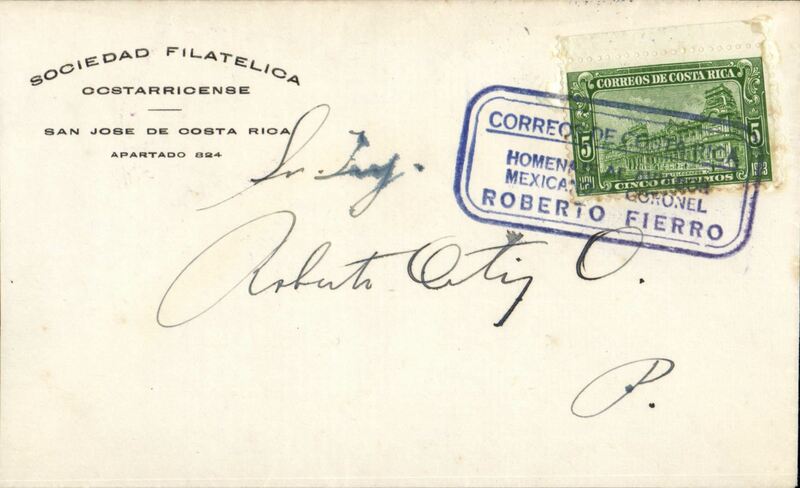 This special cancellation is described by O'Niell as being " far from Common" having been seen in only two collections in Costa Rica and he therefore doubted if it had been applied to all correspondence. 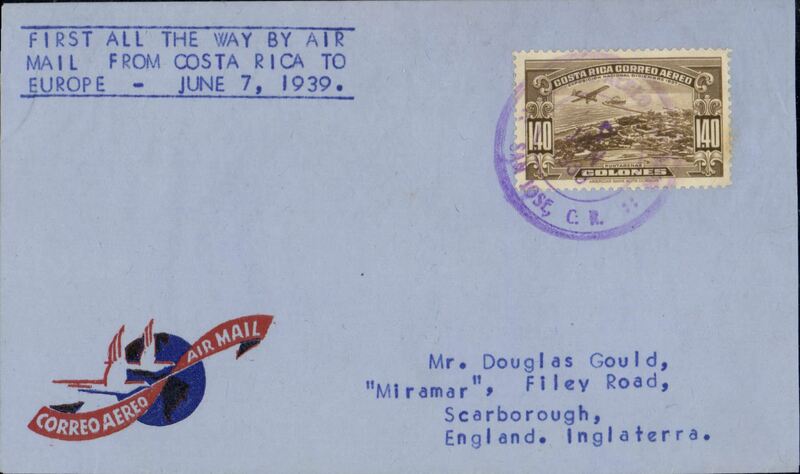 This was the first airmail service to the Atlantic zone and to the rest of the world, and an event of far reaching importance in the international and social development of Costa Rica. 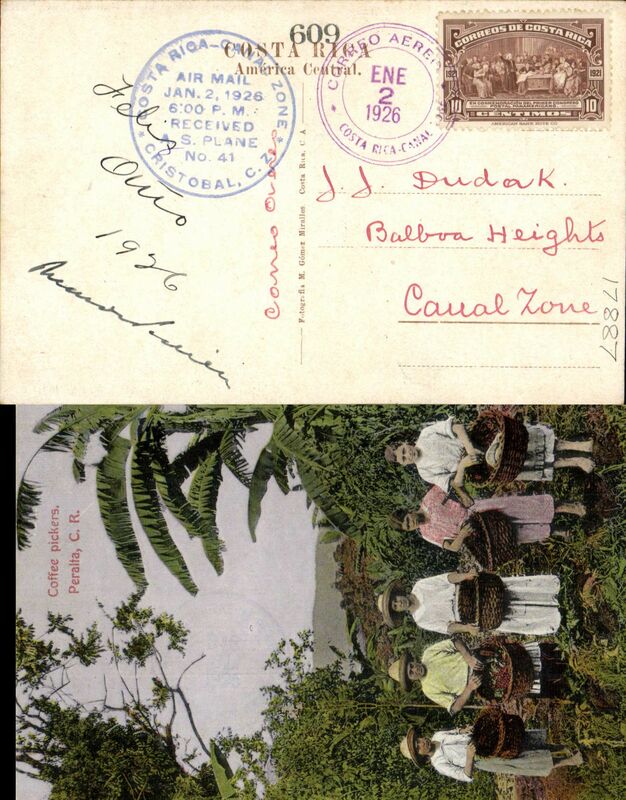 See airmail History of Costa Rica, ISBN 0-9645247-7-5, pp 10-16. 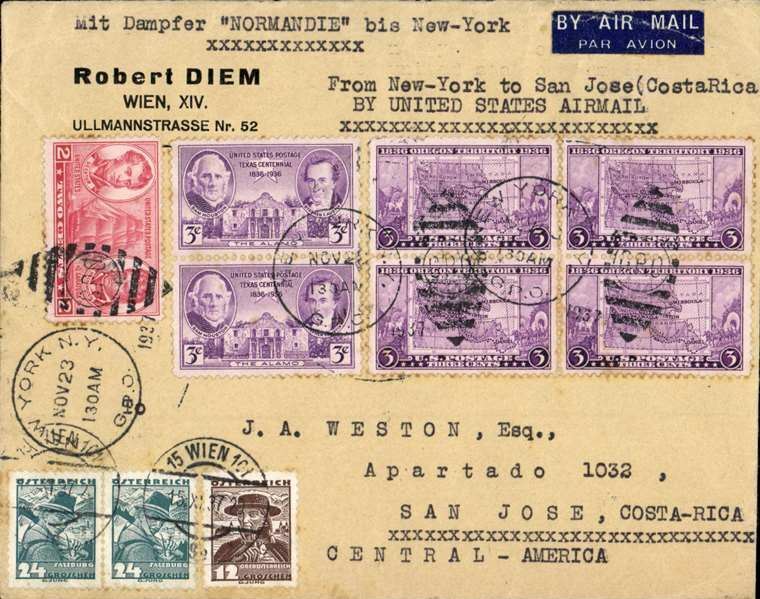 United States Army Service Plane, into San Jose 29/12 via special flight Cristobal to Port Limon, special green circular dispatch cds "AS Plane #41", violet circular San Jose 29/12 receiver on front, Roessler corner cover. 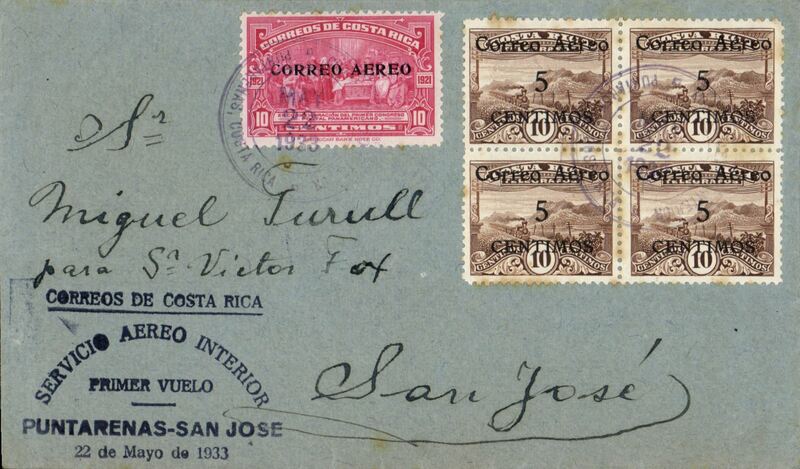 Courier flight, US Army planes, San Jose to Cristobal, circular arrival dated cachet on front "Costa Rica-Canal Zone/Air Mail/Jan 2, 1926/………../Received/AS Plane #41", printed Noriega "Correo Aereo" corner cover. 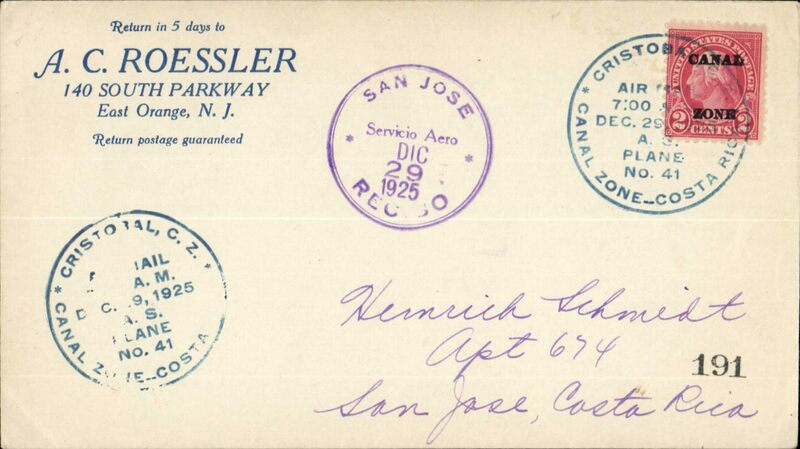 US military aviators courier flight US army planes, San Jose to Cristobal, colour PPC showing Coffee Pickers franked 10c canc special 'Correo Aereo/Canal Zone/Ene 2 1926' postmark, blue circular arrival dated cachet on front "Costa Rica-Canal zone/Air Mail/Jan 2, 1926/6.00pm/Received/AS Plane #41". 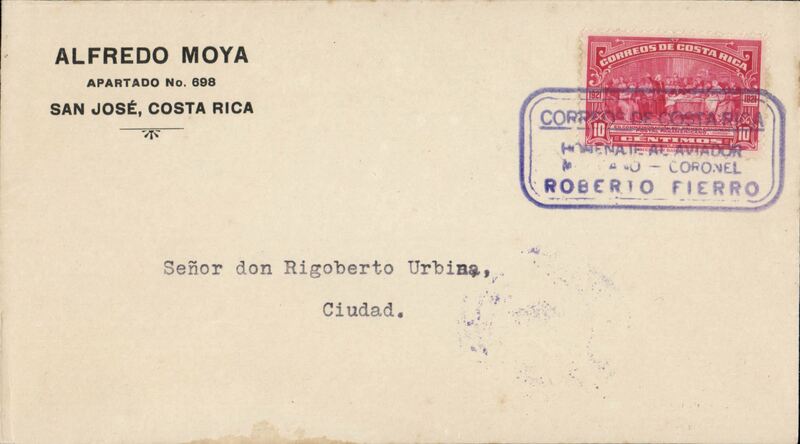 The Central American Flight of the Mexican Aviator Roberto Fierro, plain cover , franked 5c, canc fine strike blue double ring tablet style undated cachet "Correos de Costa Rica/Homenage al Aviator/Mexicano - Coronel/Roberto Fierro", verso magenta double ring "San Jose/Set 7 1928/Costa Rica". It is known that Fierro took off from Costa Rica on Sep 8th on the last stage of the tour and landed in Albrook Airfield in Panama at 12.00 the same day. Image. 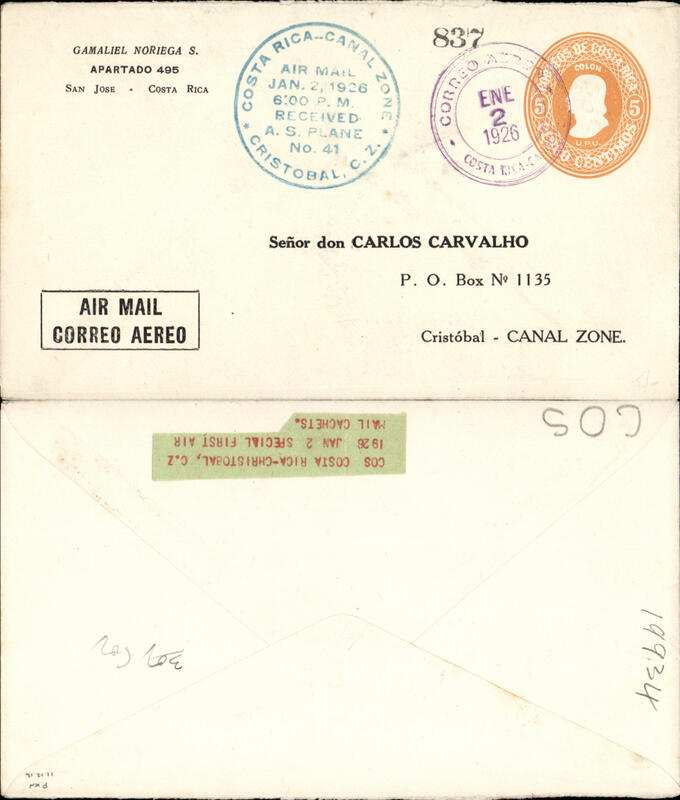 The Central American Flight of the Mexican Aviator Roberto Fierro, plain cover , franked 5c, canc blue double ring tablet style undated cachet "Correos de Costa Rica/Homenage al Aviator/Mexicano - Coronel/Roberto Fierro", verso magenta double ring "San Jose/Set 7 1928/Costa Rica". It is known that Fierro took off from Costa Rica on Sep 8th on the last stage of the tour and landed in Albrook Airfield in Panama at 12.00 the same day. Image. The Central American Flight of the Mexican Aviator Roberto Fierro, plain cover addressed to ?Panama City, franked 5c, canc blue double ring tablet style undated cachet "Correos de Costa Rica/Homenage al Aviator/Mexicano - Coronel/Roberto Fierro", verso magenta double ring "San Jose/Set 4 1928/Costa Rica". It is known that Fierro took off from Costa Rica on Sep 8th on the last stage of the tour and landed in Albrook Airfield in Panama at 12.00 the same day. 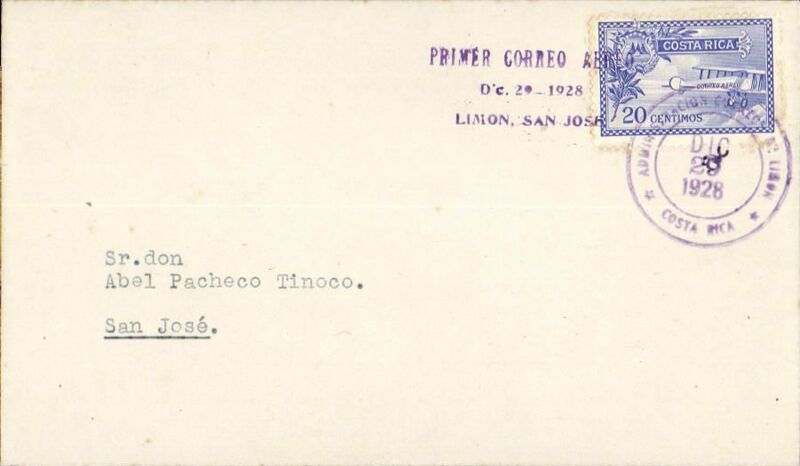 1928/29 Flood Flights, air cover from Limon to San Jose, bs 'San Jose/Dic 29 1929/Costa Rica' cds, franked 20c, canc Limon double ring 'Adminstracion Correo de Limon/Dic 29 1928/Costa Rica' cds, violet three line "Primer Correo Aereo/Dec 29 - 1928/Limon - San Jose" in the same ink as the postmark. This is only the second type Ba cover ever reported. It is also the first to be reported with a backstamp and thus confirms Saundry's theory that, following an unsuccessful first attempt on the 29th, a second, and successful, attempt was made later the same day. 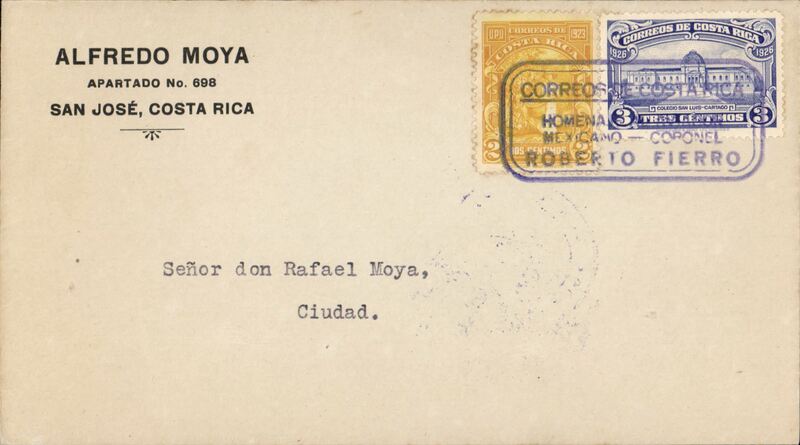 See a detailed analysis of The 1928/29 Flood Flight Covers of Costa Rica (pp 43-60, and of the 1929 flight Limon to San Jose (PP51-53), by R. Saundry, Airmail Postal History of Costa Rica, 1999. A rare and important exhibit item in fine condition. 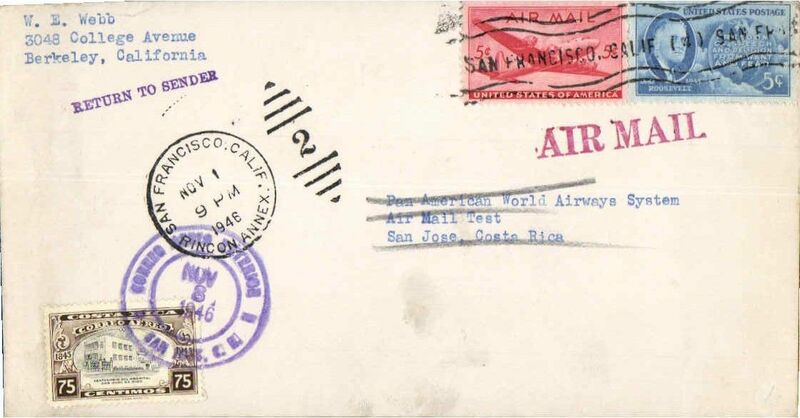 Pan Am, F/F San Jose to Miami, no arrival ds, plain cover, blue boxed purple cachet "Primer Vuelo/Costa Rica/Unaidos". 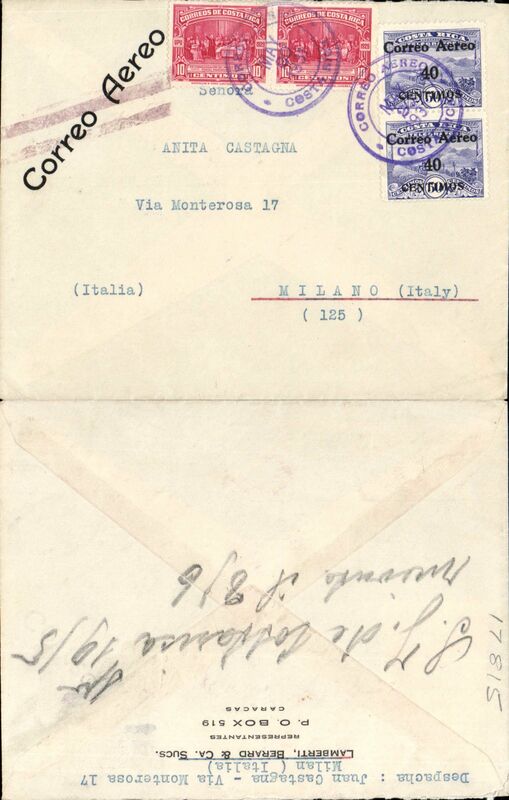 San Jose to Milan, Italy, no arrival ds, early airmail cover franked 80c air & 20c ordinary, canc Correo Aereo/Costa Rica cds, printed 'Correo Aereo' cancelled by violet double line Jusqu'a applied in New York. 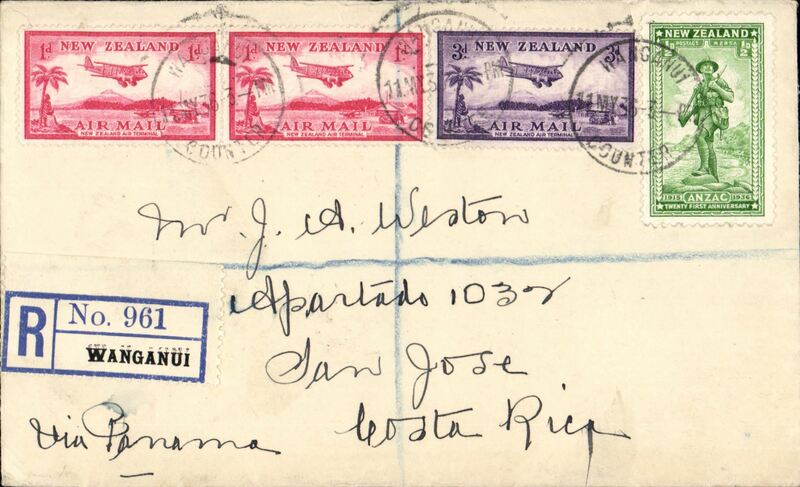 Flown by FAM 5 from San Jose to Miami, by US internal air service to New York, then surface to Europe. Nice routing. 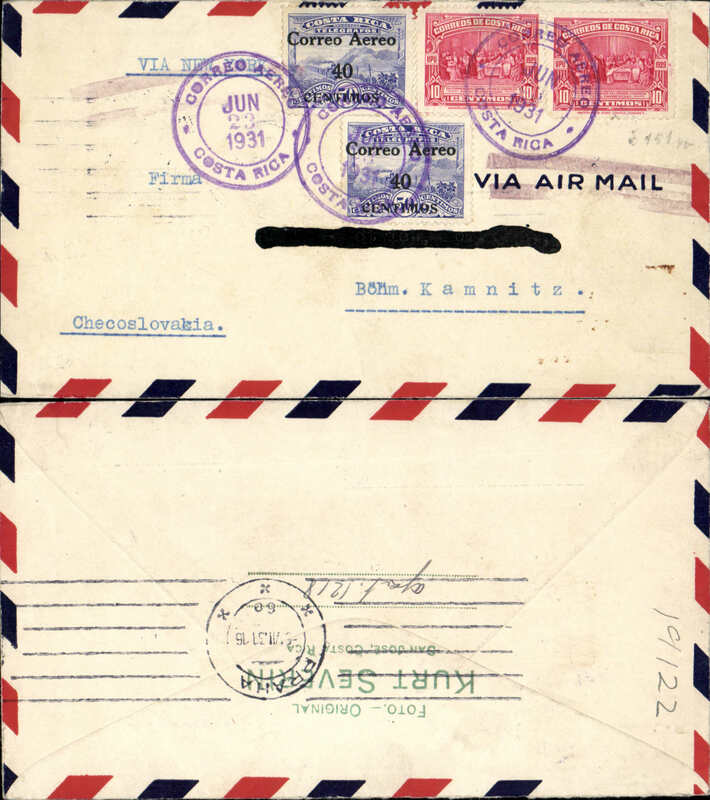 Costa Rica to Czechoslovakia, San Jose to Prague, bs 5/7, early airmail cover franked 80c air & 20c ordinary, canc Correo Aereo/Costa Rica cds, cancelled by violet double line Jusqu'a applied in New York, typed "Via New York". Flown by FAM 5 from San Jose to Miami, by US internal air service to New York, then surface to Europe. Nice routing. 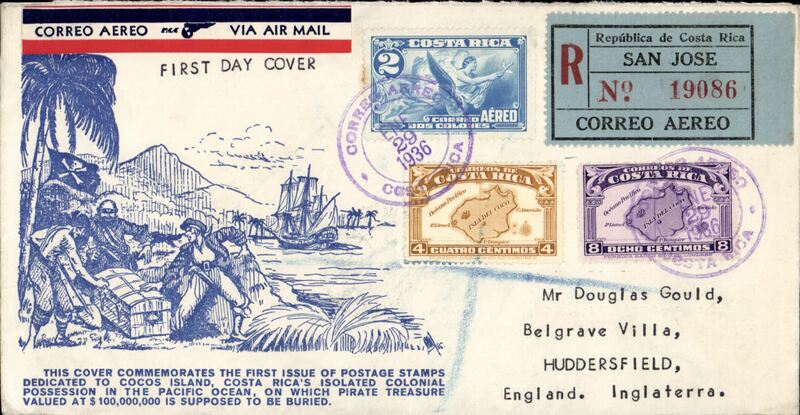 Scarce first acceptance of mail from Costa Rica for carriage 'All the Way by Air Mail to Europe, airmail cover franked 1.40 air canc San Jose cds, GB '14 June 1939 private receiver and signature. US FAM/Internal airmail service to New York, then OAT by Pan Am FAM 18 North Atlantic service. 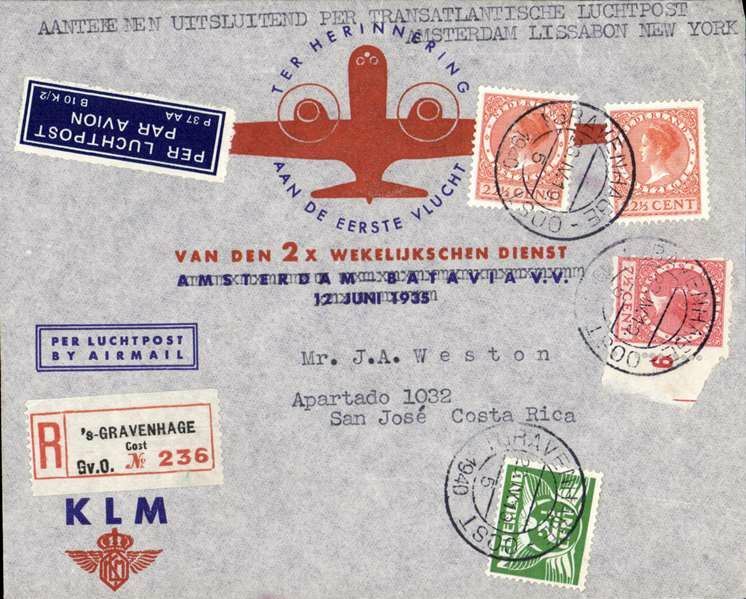 Acceptance for Costa Rica for carriage on the KLM/Pan Am Amsterda-Lisbon-New York service, then US internal airlines to San Jose, bs 13/5, registered (label) first flight souvenir cover franked 15c. 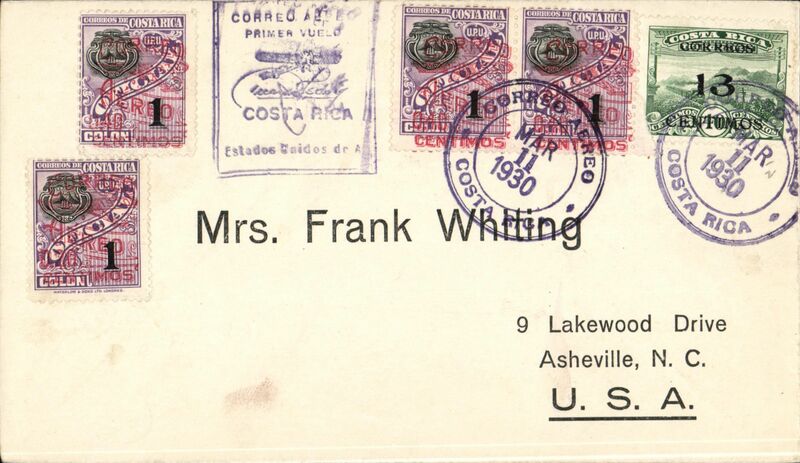 Airmail round trip test cover to Costa Rica, b/s, franked 10c canc, also 75c CR stamp cancelled for return, and black "Received/Pan American AW/Nov 5 1946" receiver verso. Also copy of illus article from March 1996 American Philatelist describing such covers as " souvenirs of an important new rate which is not listed in AAMC", and of an article in Apr/June 1998 JLKAL by R Saundry about the, as yet, unrecognized, scarcity of these covers. An uncommon destination for this particular flight.